Once you have a child, it’s time to start thinking about the baptism. Holy Baptism is the first sacrament that an Orthodox Christian participates in. Since it marks the beginning of the child’s Christian life, this is a celebratory and happy time that is normally shared with family and friends. There are two things that need to be planned – the ceremony itself and the reception that follows. Here is some advice that will help you plan the festivities. The first thing you will need to do is select the child’s godparent or godparents. The Orthodox Church only requires one godparent, but two may assume the duties under certain circumstances. In general, the godparent needs to be an “Orthodox Christian in good standing.” Since each case is different, you will want to discuss your choices with your priest. Being a godparent is about more than just showing up for the baptism. He or she will be responsible for the spiritual upbringing of the child. Though there are many traditions associated with choosing one, ultimately you will want to select the person who will perform this role the best. Once the godparent is selected, the next step is to buy the items that the priest will need for the ceremony. The responsibility for these items falls on the godparent. However, it’s still a good idea to discuss this with the parents because there are some exceptions. Items include a gold cross, white towels, one large white candle, two smaller white candles, a white outfit to change the child into, oil, and more. For a complete list, you’ll want to check with your priest. While it’s the godparent’s responsibility to pay for anything associated with the baptism itself, it’s the parents’ responsibility to plan and pay for the reception. As mentioned, there are exceptions. However, it is really up to the godparent and the parents to decide in this arena. In general, the reception can be held at the church, in a home, at a restaurant, or at a function hall. A lot will depend on how large the guest list is. 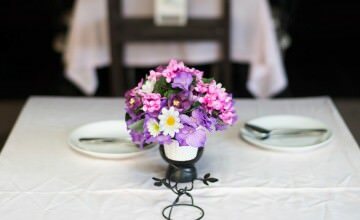 If it’s a smaller crowd, it will be easier to have the reception at a home or a restaurant. A lot will depend on your budget, too. Handing out favors during the Christening is more of a tradition than a necessity. However, most of your Greek guests will expect both a witness pin, or Matyrika, and Jordan almonds, also known as Koufeta in Greek. Typically, the godparent will buy the witness pins and the parents will buy the Koufeta. But, this can also be discussed between the parents and godparents because there are exceptions to this rule. Aside from being a time to celebrate, Holy Baptism is one of the seven sacraments. During the ceremony, the child is also Chrismated and given Holy Communion for the first time. Friends and family look forward to being part of this.